If you are unable to read this message, click here to view. 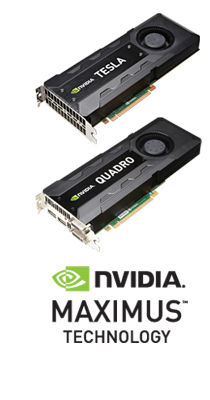 Participate and stand to win NVIDIA Quadro K5000 GPU! With NVIDIA MAXIMUS, designers and engineers can now perform simultaneous CAE, rendering, or structural/fluid analysis on the same system being used for design work. Plus, content-creation professionals can perform faster video editing, effects, and animation. Tell us what types of tasks you would perform if you had the NVIDIA MAXIMUS system. How would this benefit your business? Write your response within this forum, and stand a chance to win NVIDIA Quadro K5000 card. The first 50 submissions will receive a gift from NVIDIA. Please use your valid email address upon registration so that we can reach you if you win. Look for a forum post announcing the winner on 4th of February! Stay up-to-date on driver releases, reviews and special promotions - some exclusively for our newsletter subscribers. Find us online for all news and multimedia related to NVIDIA!